Windsor Castle is one of the most famous Castles in the World. Windsor is the oldest and largest castle which can boast continuous occupation for over 900 years. Queen Elizabeth II and the Royal family regard Windsor Castle as their home. Windsor Castle has a chequered history which moves from its construction as a Wooden Motte and Bailey castle by William the Conqueror to a massive stone fortress. Surviving siege warfare to the Age of Medieval Knights and Chivalry and the English Civil War. In 1649 a bill, in the English parliament, to demolish Windsor Castle was defeated by just one vote! Windsor Castle has been neglected and declared inhabitable and then transformed into a luxurious palace. Windsor Castle has survived two World Wars and was then nearly destroyed by an accidental fire! Is it any wonder that people are fascinated by the magnificent Windsor castle? What is the castle used for today? How many years has Windsor castle existed? The castle, after centuries of alterations, contains about 1,000 rooms and occupies 13 acres of land. William the Conqueror chose the site of Windsor Castle at 'New Windsor' - taking the name from the 'Old Windsor' which was used by the Saxon Kings of the Dark Ages. 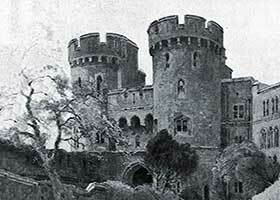 'New Windsor' was 100 feet above the river Thames and on the edge of the Saxon hunting ground. Despite countless additions and alterations the outer walls and the central mound of the castle are still in the same position as those of the original castle built by William the Conqueror. It was a day's march from the Tower of London and intended to guard the western approaches to the capital of England. Windsor Castle consists of three “wards” - the upper ward , the middle ward and the lower ward. The castle itself is not just the only link with history. There are a dozen ancient oak trees which date back to the Norman Conquest. The Queen is often in residence at Windsor Castle and this is indicated by the Royal Standard flying over the Round Tower. When the Queen is not in residence the Union Jack flag flies in its place. There are seventeen pieces of cannon mounted on the curtain wall of the Tower. When the disastrous fire burned Windsor castle approximately one-and-a-half million gallons of water was used to put out the blaze. Windsor castle is steeped in English history - the Timeline detailing the dates of the most important facts and information about Windsor Castle will provide even more fascinating and comprehensive details about this magnificent building.